The University of Maryland, College Park (commonly referred to as the University of Maryland, UMD, or simply Maryland) is a public research university in College Park, Maryland. 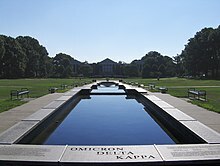 Founded in 1856, UMD is the flagship institution of the University System of Maryland, and is the largest university in both the state and the Washington metropolitan area, with more than 41,000 students representing all fifty states and 123 countries, and a global alumni network of over 360,000. Its twelve schools and colleges together offer over 200 degree-granting programs, including 92 undergraduate majors, 107 master's programs, and 83 doctoral programs. UMD is a member of the Association of American Universities and competes in intercollegiate athletics as a member of the Big Ten Conference. During the Civil War, Confederate soldiers under Brigadier General Bradley Tyler Johnson moved past the college on July 12, 1864 as part of Jubal Early's raid on Washington, D.C.  By the end of the war, financial problems forced the administrators to sell off 200 acres (81 ha) of land, and the continuing decline in enrollment sent the Maryland Agricultural College into bankruptcy. For the next two years the campus was used as a boys preparatory school. Following the Civil War, in February 1866 the Maryland legislature assumed half ownership of the school. The college thus became in part a state institution. By October 1867, the school reopened with 11 students. In the next six years, enrollment grew and the school's debt was paid off. 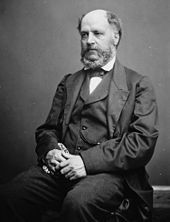 In 1873, Samuel Jones, a former Confederate Major General, became president of the college. On November 29, 1912, a fire destroyed the barracks where the students were housed, all the school's records, and most of the academic buildings, leaving only Morrill Hall untouched. There were no injuries or fatalities, and all but two students returned to the university and insisted on classes continuing. Students were housed by families in neighboring towns until housing could be rebuilt, although a new administration building was not built until the 1940s. A large brick and concrete compass inlaid in the ground designates the former center of campus as it existed in 1912. The nation's first living-learning entrepreneurship program, Hinman CEOs, is geared toward students who are interested in starting their own business. Students from all academic disciplines live together and are provided the resources to explore business ventures. Other living-learning programs include: CIVICUS, a two-year program in the College of Behavioral and Social Sciences based on the five principles of civil society;  Global Communities, a program that immerses students in a diverse culture (students from all over the world live in a community),  and the Language House,  which allows students pursuing language courses to live and practice with other students learning the same language. The Center for Technology and Systems Management ( CTSM) aims to advance the state of technology and systems analysis for the benefit of people and the environment. The focus is on enhancing safety, efficiency and effectiveness by performing reliability, risk, uncertainty or decision analysis studies. 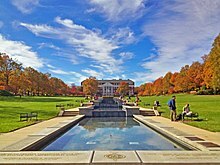 The campus of the university is noted for its red-brick Georgian buildings and its large central lawn, named McKeldin Mall, which is the largest academic mall in the United States. 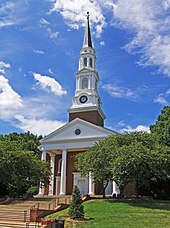 White columns decorate many buildings, with around 770 columns existing on campus. Spanning the university's 1,250 acres (5.1 km2) are 7,500 documented trees and garden plantings, leading the American Public Gardens Association to designate the campus the University of Maryland Arboretum & Botanical Garden in 2008. The designation has allowed the university to showcase species and gardens, including native plantings. There are arboretum tours, such as the centralized Tree Walking Tour which is based around McKeldin Mall and features 56 specimen trees. Outside of the Stamp Student Union on Campus Drive is the Jim Henson Statue and Memorial Garden, in honor of the late Jim Henson, a Maryland alumnus. A likeness of Henson is seated on a park bench, facing arguably his most famous creation, Kermit the Frog. 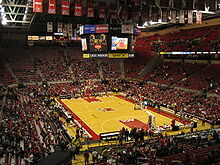 To the north and northwest of Stamp and Hornbake Plaza are the North Campus communities, Maryland Stadium, the Eppley Recreation Center (the main gym on campus), the XFINITY Center, and the Wooded Hillock, a 22-acre (8.9 ha) forest located next to the XFINITY Center; Stadium Drive runs between the more southern Maryland Stadium and the rest of these. The Clarice Smith Performing Arts Center sits to the west of Maryland Stadium. Another thoroughfare, Regents Drive, runs perpendicular to McKeldin Mall and is home to the Memorial Chapel and the Campus Farms. Regents Drive crosses Campus Drive at the campus hallmark "M" Circle, which is a traffic circle with a large "M" formed by flowers in its center. The northeast quadrant of campus, formed by Campus and Regent Drives, is home to many of natural sciences and applied sciences departments. The university is also divided by U.S. Route 1, known locally as "Baltimore Avenue." While most of campus lies to the west of Baltimore Avenue, fixtures such as fraternity row and the Leonardtown Communities lie to the east. Sitting on the western edge of Baltimore Avenue are the Visitors' Center, also known as The Dairy, The Reckord Armory, and The Rossborough Inn, which, built during the years of 1798 to 1812, is the oldest building on campus (and is older than the university itself). There are five regularly used entrances to campus; the main entrance, off of Baltimore Avenue and onto Campus Drive, is referred to as North Gate and features the Gatehouse, an ornate gateway honoring the university's founders. The 140-acre (57 ha), 18-hole University of Maryland Golf Course sits at the northern edge of campus, as does the Observatory. The campus is also home to one of the root servers, responsible for operating DNS. Maryland also promotes the use of reusable to-go containers at the dining hall, or OZZI containers, since the official launching of the program in August 2011. Students pay a $5 fee to initially use the container, but receive a coin when they return it to the dispenser. With the coin, the use of the container is cost-free. A free shuttle service, known as Shuttle-UM, is available for UMD students, faculty, staff, and some residents of College Park and Greenbelt. The university is served by an off-campus stop on the Washington Metro Green Line called College Park – University of Maryland. The station is also served by the Camden Line of the MARC Train, which runs between Baltimore and Washington. A Shuttle-UM bus (Route 104) arrives at the station every five minutes during fall and spring semesters (every ten minutes during the summer) to bring visitors to campus (stopping in front of the Stamp Student Union). Metrobus and Prince George's County TheBus bus services also stop on campus. Beginning in early 2012, TheBus services for Route1Ride (Route 17) were made free of charge to all University of Maryland students and staff, providing service on Route 1 from the Washington, D.C. border to the IKEA in College Park, with a stop at the College Park–University of Maryland Metro station. There is an additional service called Nite Ride which is a curb-to-curb service offered every night from 5:30 p.m. to 7:30 a.m. The service is designed to serve the areas of campus that are not included on the evening service routes. The Diamondback is the independent student newspaper of the university. It was founded in 1910 as The Triangle and renamed in 1921 in honor of a local reptile, the Diamondback terrapin, which became the school mascot in 1933. The newspaper is published daily Monday through Friday during the spring and fall semesters, with a print circulation of 17,000 and annual advertising revenues of over $1 million. It has four sections: News, Opinion, Sports, and Diversions. Approximately 15% of men and 20% of women in Maryland's undergraduate student body are involved in Greek life. 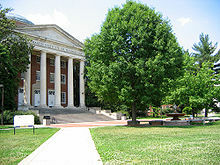 Many of the fraternities and sororities at the school are located on Fraternity Row and the Graham Cracker, which are controlled by the University. Fraternity Row is the background of several recently produced films. All social Greek organizations are governed by one of five groups: the Inter-Fraternity Council, the Panhellenic Association, the Pan-Hellenic Council, the United Greek Council, or the Professional Fraternal Association. All cultural Greek organizations are governed by the United Greek Council. These councils assist in the creation and governance of chapter by-laws, risk management plans, and philanthropic activities, with support from the Department of Fraternity and Sorority Life. Each year, every Greek organization must fulfill certain requirements, including doing a service and conducting a program/event related to community service, diversity, or alumni and faculty outreach. Men's basketball is one of the most popular sports at the university. Long-time head coach Lefty Driesell began the now nationwide tradition of " Midnight Madness" in 1971. Beginning in 1989, alumnus Gary Williams revived the program, which was struggling in the wake of Len Bias's death and NCAA rules infractions. Williams led Maryland basketball to national prominence with two Final Four appearances, and in 2002, a national championship. On February 7, 2006, Gary Williams won his 349th game to surpass Driesell and became Maryland's all-time leader among basketball coaches. In May 2011, Williams retired as head coach, which allowed for the entrance of the new head coach, Mark Turgeon. The court at XFINITY Center was named in honor of the beloved coach, Gary Williams. Maryland football is also popular at the university. The Terrapins were awarded the national championship by the wire services in 1953, and in 1951, by several retroactive selectors. ^ Romas, Maria. " No place for children." The Diamondback. Friday March 18, 2011. Retrieved on October 3, 2011.